Learn lean 5S best practices. By following 5S best practices, it makes work areas organized, clutter free, safe, efficient, and easy to work in. 5S housekeeping refers to workplace organization and standardization. It is the basics for companies pursuing lean manufacturing. It lays the lean groundwork and develops the lean discipline for every department within your company. If you are ready to start a 5S project, click here to learn about StreamLiner software. The first of the lean 5S principles is Sorting. Throw away all trash. Establish wastebaskets within 4 steps of employee. Encourage throwing away junk as the junk is created. Do not allow unnecessary items to be posted on walls. This includes family pictures, post it notes, taped papers with handwritten scribble, etc. Keep walls clean. Posted items should be printed work related items that employees need everyday. These items are for work only. Use established color paper for these posted references. Color paper prevents unwanted clutter. Create signs for work stations. With signs, unfamiliar employees will find work stations quickly. When applying 5S best practices, consider using red tags. Employees red tag those items that are not necessary. The red tag identifies the item, who moved it, date moved, and movement reason. Remove these from the work area. Gather all unnecessary (but still usable) items from all departments into one area for quarantine. Allow all employees to review the hold area. They may find something needed for their department. After a limit of 30 days, remove the remaining quarantine items. Consider contacting other corporate divisions as they may need the items. Also consider selling the items on the internet through eBay or recycling. Keep and maintain this quarantine area for on-going 5S sorting. After implementing sorting from 5S best practices, you find several benefits. Cycle time is reduce because tools are easier to find. Employee to employee communication is improved. There is much less wasted space and inventory is minimized. The second of the lean 5S principles is Set in Order. Keep frequently used items at the workstation. For all these items, establish mark locations for their storage. When not in use, return these items to the mark locations. Mark table storage spots with color tape. Use visual controls to identify the location of the items. Set rules on colors. For example blue tape on tables could mean “store here”. Red tape could mean “don’t move” etc. From 5S best practices photo includes using pegboards to hold tools. Outline the tools figure on the boards. For items held in drawers use low labeled boxes to hold the tools. Use labels extensively to mark the items storage areas. Another 5S best practices is to create a 5S map / photo of the department. This map shows the locations of all 5S storage areas, work stations, tools and equipment. For items used only weekly or monthly, store these in cabinets near the work station. Label the shelves on the cabinets with the item name. If the item is stored in a box, then label the outside of the box. For items rarely used, keep these outside of the work area. You may store these in a location within the company that all departments use for the same purpose. In this case label the item and the department name. Use a checkout sheet to log the in/out status and responsible person. For perishable items, establish reorder points, minimum and maximum quantity. Establish person responsible for reordering. Be sure to include cleaning supplies. The third of the lean 5S principles is Shine. Clean everything and continuously clean. Allow for time at the end of the day to conduct the cleaning. This includes cleaning equipment, sweeping floors, dusting tables and cabinets. Create a 5S checklist that documents the cleaning actions and frequency. After completing the task, have the responsible person sign the checklist. Consider how things are cleaned. In some cases it will be water and sponge or it could be alcohol or acetone. Document the specific method on the check sheet. For complicated cleaning processes write a procedure and train the employees. Shining means to inspect while cleaning. Find safety hazards, loose wires, sharp corners, chipped tools, poor connectors, cracked hoses, etc. Fix these items and put the equipment in brand new condition. Replace any worn, defective or unsafe components or equipment. 5S best practices include using a portable shine cart. Store cleaning supplies on the cart, Move the cart from location to location to conduct the cleaning. At the close of the day or prior to a significant time away from the work station put all equipment and tools back to their label / marked locations. Allow time for this. Schedule painting. This includes painting walls and equipment. This is not a one time occurrence. Set a frequency such as yearly and make someone responsible. Shining makes the area safer, more efficient and produces better quality parts. It also impresses your customers. The fourth of the lean 5S principles is Standardize. Make Sorting, Set in Order, and shine as normal as brushing your teeth. Make it a habit. When you standardize, you create the rules, and enforce the rules. Many companies fail at this stage because management does not create and enforce the rules. 5S housekeeping is not a one time event. It is constantly on-going. When new items enter in the department, set a location, update check sheets and 5S maps as necessary. Write procedures that cover sorting, set, and shine. Focus on prevention of dirt, dust and grime. What is causing the dirt, what can be done to eliminate the dirt. Conduct regular training so all employees are on the same page. Do they understand the color tapes? Do they understand the rules for posting documents? Are they responsible for cleaning? 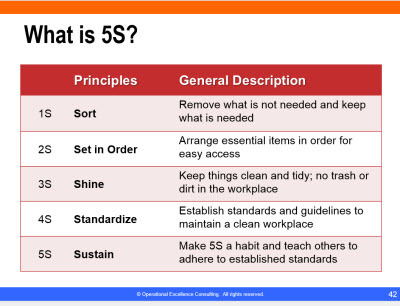 The fifth of the lean 5S principles is Sustain. Periodicaly conduct 5S audits. 5S Audit the locations of all equipment. 5S Audit the checksheets. 5S Audit the department cleanliness. 5S Audit the employees knowledge of the 5S. The 5S housekeeping system must be supported by top management. Top management needs to monitor the use of 5S and encourage 5S best practices. Top managements should provide the structure, support and award 5S best practices. Encourage employees to find better ways to sort, set, shine and standardize. They do it, they know what works and what doesn’t. Empower them to make changes. To encourage sustaining, consider slogans, posters, and maps. Using StreamLiner for 5S projects. What is 5S Visual Management?